Telling a story in less than 2 minutes? Tolstoy was famous for his very short stories. In the Netherlands there is a new genre, ZKV (ultrashort stories), telling a story in as few words as possible. Does Dylan succeed in the ultrashort songs? Yes he does. Listen for example to Father of Night and Crash in the levee (rediscovered this beautiful gem from Basement Tapes). Imagine the length of all this 10 short songs equals the length of one song, Highlands. Many readers mail me about All the tired horses in the sun being the shortest song. In words yes (16 words) in length no (3:10). The song is longer than all the 10 songs mentioned. 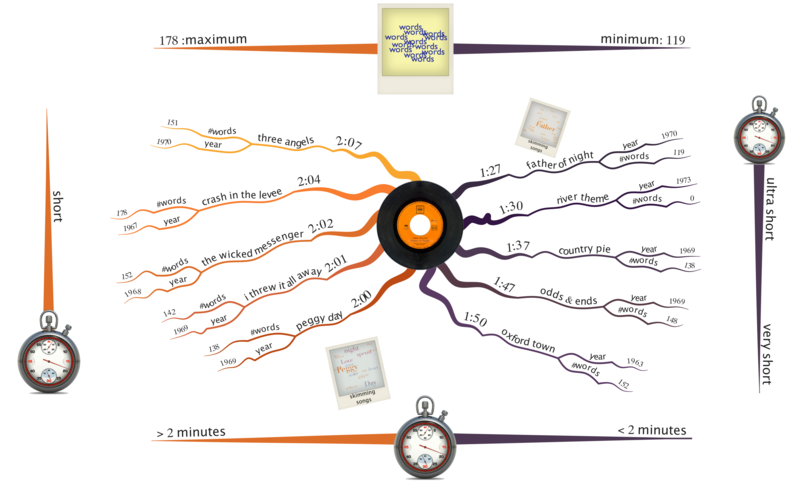 This entry was posted in art, mindmapping, music. Bookmark the permalink. Hey, you totally forgot ‘Jet Pilot’, the shortest of them all! No I have not forgotten Jet Pilot, but I have not included the song, because it is a fragment.